Bahamas fishing offers your best chance at some of the best Big Game Sportfish in the World. Offshore you'll find Marlin, Wahoo, Dolphin and Tuna. Or bottom fish for groupers & snappers. The Bahamas flats offers great bonefishing all year round. Over Under Sport Fishing specializes in group outings, family vacations, corporate entertainment, and couples just looking to cruise the Bahama Islands. We can create full fishing packages including flights, accommodations, meals, and fishing. We are fully set up for inshore or offshore fishing, snorkeling, sightseeing, island hopping and extended multi-day voyages. 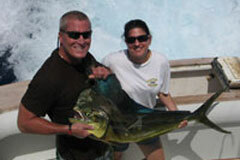 We offer single day fishing and diving outings, as well as multi-week cruising itineraries. Please call us to discuss your desired Bahamas Fishing Vacation. Our Bahamas Charter Boats are available for both fully crewed and captained only live aboard charters. Extended leases are available for private Sportfish Boat owners looking to leave their boat stateside this season. Tell us what you want to do, where you want to go, and let us take the hastle out of your next Bahamas Boating Vacation. Read our Bahamas Fishing Letter which has great info about your Bahamas Fishing Vacations. OVER UNDER is currently in the Abacos for the majority of the year. We have full packages with Treasure Cay Resort & Marina - Treasure Cay Fishing Packages. As always, our Bahamas based boats are available to go anywhere in the Islands on a weekly or longer term basis. Please call us now to reserve your 2011 Prime Dates! We will once again be offering Treasure Cay Packages, Live-Aboard Trips, Weekly Charters, and be visiting the Southern Bahamas on a limited basis. If you are interested in fishing in Cat Island, San Salvador, Rum Cay, or further South to Crooked Island and Diana Bank, please call us at least 6-9 months in advance, so we can plan schedules accordingly..
November is the beginning of the Bahamas wahoo fishing season, dolphin are still around and shots at billfish are definitely possible. 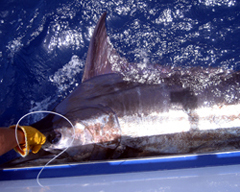 Billfish include white and blue marlin as well as sailfish. Often times, we get the most numbers of Wahoo in the later part of November. December is getting into peak wahoo season, and as usual dolphin are always around. This is probably the last likely chance at a marlin in the Bahamas, until spring time. The weather is typically still reasonably settled, making this a good bet for Family Trips before the winter cold fronts set in. Wahoo, Wahoo, Wahoo! By now the wahoo are starting to get rather large. Shots at sailfish in the winter are not out of the question. Wahoo fishing in the Bahamas is now peaking! Wahoo still going strong, but yellowfin and dolphin are becoming more prevalent. 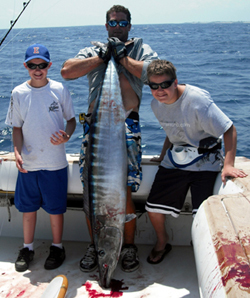 This is your best shot at catching a really large wahoo in the Bahamas. The main wahoo bite comes to an end while dolphin and tuna bites, as well as shots at billfish start to dominate. Early March is still a great time to come chase after world class Wahoo. April is traditionally the beginning of the yellowfin tuna bite. Still good chances for wahoo bites, and billfish are starting to show up more regularly. April is a great all round time to charter a boat in the Bahamas. Probably one of the best months for ACTION! May is the most popular time for Bahamas Fishing. The Yellowfin going strong and the dolphin bite peaks. Blue and white marlin are now around in good numbers. If you are looking to go Blue Marlin fishing in the Bahamas late May is an ideal time to visit. Fishing between the Full and the New Moons the end of June into the middle of July should produce the best blue marlin fishing of the year. Yellowfin are still around and dolphin should continue to be available, although not as much as in May or June. Probably the best bet for your family vacation. Once again, as the moon rolls around, August will provide another excellent chance to target Blue Marlin in the Southern Bahamas, and the bottom fishing on the reef is excellent. Lobster season opens August, 1 every year too!